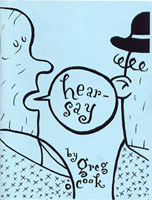 Hearsay: This is a word that is mainly used in law and is evidence that is presented from a witness that wasn’t present during t he actual incident. How many of us operate off hearsay from time to time. I know I am guilty of it, but now I have a new way of handling hearsay in my life. I try not to operate off of rumors. It’s best to know the truth about what ever situation is before you before you judge and react. Always communicate with the important parties involved and when you come to resolution, stick to it. Don’t let people plant negative words in your ears about situations they have absolutely no idea about. Always stick to the truth.